The mind-blowing scale of the Panama Canal and the historic buildings of Panama City, the lush rainforests and beautiful beaches of Costa Rica – these two central American countries have a lot to explore. Our Panama Canal & Costa Rica Combo will take you to some of the stunning highlights of these destinations, ensuring that you are pampered with luxury every step of the way. The Panama Canal is one of mankind’s most impressive constructions and watching the enormous ships move through its locks is a larger than life thrill. 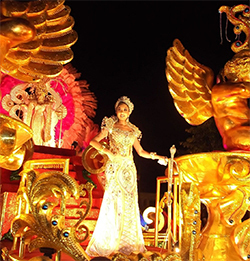 Panama also boasts much more than just it’s canal. You can explore the history of Panama City’s cobbled streets, sip cocktails on the beaches of the laid back Bocas del Toro islands and quench your thirst for adventure with extreme sports in the lush and cool highlands near Boquete. Costa Rica will take your breath away, with its volcanic peaks, mysterious cloud forests and soft sandy beaches. If you are a nature lover you will have the opportunity to spot many creatures in the wild, from giant lizards to colourful birds to graceful slow moving sloths. This country has the greatest density of species in the world and approximately a quarter of its land is protected by national parks and conservation areas. The climate and landscapes are incredibly diverse in Costa Rica, from volcanoes to temperate forests to tropical beaches and high mountains. We can take you on an adventure to Panama and Costa Rica where you can experience the best these beautiful countries have to offer, while relaxing in comfort and style. Your experienced guide will reveal insights and help you to make the most of your experience. Are you ready for your Central American adventure? Any time of the year is a good time to visit the Panama Canal, although the dry season from mid-December to mid-April offers the best possible weather. However, this is also the high season so there will be bigger crowds and higher prices. On the Pacific Coast there is a wet season from May to November and on the Caribbean Coast the weather is consistently warm. Of course, one of the most intriguing things to do in Panama is to visit the Panama Canal. This amazing 48 mile canal connects the Pacific to the Atlantic and is considered the 8th Wonder of the World. Panama is a dream destination for nature lovers and if you want to immerse yourself in the natural beauty you can visit Veragua Rainforest Research and Adventure Park. Take a ride on the sky tram through the lush rainforest canopy, stroll along the walking trails and hanging bridges and admire the stunning waterfalls. Also, take the opportunity to explore the historic Casco Viejo and admire the architecture of the President’s Palace. It is a gorgeous Spanish mansion, known as the “White House” of Panama. 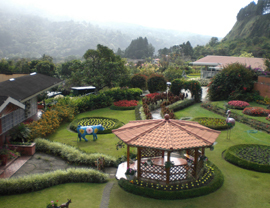 You can also visit Boquete in the Western Highlands, a cool and refreshing mountain town. 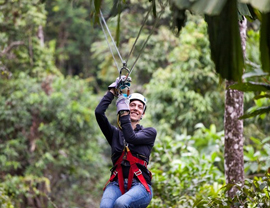 This is a great destination for adventure seekers as you will have the opportunity to hike Los Quetzales, go white water rafting on the Chiriqui Viejo River, go on a zipline tour and so much more. Citizens from many countries, including the United States, United Kingdom, Canada, New Zealand and Australia may enter Panama on a tourist visa that is stamped on arrival and valid for 180 days. Your passport should be valid for at least three months past the date of entry and you must have a return ticket booked to your home country or an onward destination. You may also need to show that you have at least $500, either in cash, a bank statement or a credit card. Because your tourist visa will be a stamp within your passport it is important to carry a copy of the ID page and the tourist visa stamp page with you. Panama has excellent healthcare and it is a popular destination for medical tourism, so if you fall ill while here you will be well taken care of. Tap water is safe within the cities, although in more remote areas bottled water is recommended. It is not recommended for pregnant women to travel to Panama or Costa Rica, as outbreaks of the Zika virus have been reported. When entering Panama you may be required to show proof that you have been vaccinated for Yellow Fever, but only if you are arriving from a country where it occurs – such as much of Africa and South America. The CDC recommends that you should be vaccinated for Hepatitis A, Typhoid, Hepatitis B, Rabies and Yellow Fever. Also, talk to your doctor about whether you need to take medicine to prevent Malaria. The official currency of Panama is the Balboa. The value of the Balboa has always been linked to the US dollar – one balboa equals one dollar. It is named for the Spanish explorer Vasco Nunez de Balboa. The US dollar is also a legal tender in Panama and most of the transactions in Panama are done in US currency. You might get your change back in US coins with Panamanian stampings. 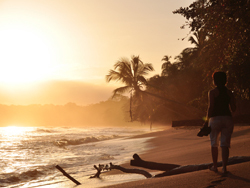 The best time of the year to visit Costa Rica is during the peak season from December to April. The weather will be at its best, with plenty of warm sunshine. Of course, this is the most popular time to visit to prices will be highest. Prices will be lower from May to November, if you don’t mind getting a little bit wet. 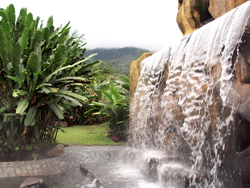 There is so much to see and do on your travels in Costa Rica. You can visit the amazing Arenal Volcano National Park, where you can admire the view of the snowcapped Arenal Volcano and enjoy many adventurous activities such as hiking, white water rafting and horseback riding. Or, relax in the warm soothing waters of the natural hot springs. You can also head to Rincon de la Vieja National Park, which has a large steaming volcano that has created many amazing natural phenomena including vapor vents, hot springs and bubbling mud pits. Tortuguero National Park on the Caribbean Coast is another amazing Costa Rica attraction. It is an important breeding ground for endangered green turtles and it is also home to other creatures such as monkeys, sloths and manatees. You can also visit Monteverde and take a hike through the misty cloud forest canopy. 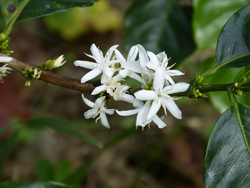 Costa Rica is also famous for its coffee, so visiting a coffee plantation is a must-do activity. Make sure to bring home some bags so that you can savour the flavour when you return home. Our packages are all inclusive, so every detail is taken care of and any experience you want to have at the Panama Canal or in Costa Rica can be easily arranged – just let us know! Most visitors will be able to enter Costa Rica without a visa and stay within the country for 90 days. When you arrive you will need to show proof of travel out of Costa Rica. If arriving from most of the neighbouring countries you will need to show a valid Yellow Fever certificate. Costa Rica is peaceful, politically stable and well developed, so it is generally a very safe destination to visit. Take the same precautions against pickpockets that you would in any destination, such as keeping your wallet in your front pocket, being aware of your surroundings and not wearing valuable jewellery. Before travelling to Costa Rica you should receive vaccinations for Hepatitis A, Typhoid, Hepatitis B and Rabies. You might be required to show proof of Yellow Fever vaccination if you are arriving from a country with a risk of Yellow Fever. The currency in Costa Rica is the colon, which is named after Christopher Columbus. US dollars are also widely accepted in Costa Rica and some hotels and restaurants will list their prices in US dollars to make things easier for travelers. Our Panama Canal and Costa Rica tour experiences will offer you an experience of a lifetime. To learn more about the Panama Canal and Costa Rica and to book one of our fantastic tour experiences, please contact us today!